WTF Are You Reading? : Feel the Fire of "Dark Frost"
Though Dark Frost is the third book of the Mythos Academy series, it has just as much fire as the books that came before. Gwen Frost is doing the best she can to learn all the things that she needs to know to serve as champion to the goddess Nike. Add to that the fact that she seems to be on the most wanted list of evil servants of imprisoned God of Chaos, Loki, and the key to the whereabouts of a magical blade that is meant to serve as the key to Loki's release. This is a wonderfully written story brimming with myth and magic. 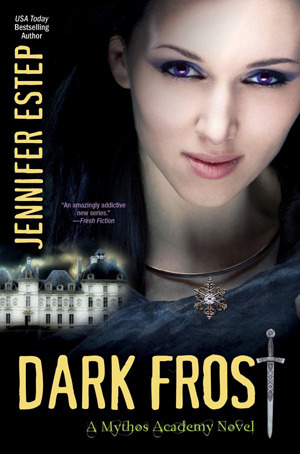 Unlike so many authors who choose to include myth and legend in their tales; Jennifer Estep combines myths from several cultures, presenting them to readers within her story while still managing to maintain their individual integrity within the overall pantheon. Gwen is a very likeable character who handles the challenges that face her in this read with a grace and maturity that is far beyond her years. She pulls at the heart-strings with her ability to be brave out of necessity while still unsure that what shes doing is right. The battles that Gwen fights with the bad guys of this story may be fierce, but they can't hold a candle to the ones that she is fighting within herself. Reapers, Loki, a mystery, love, and adventure await those brave enough to weather Dark Frost.